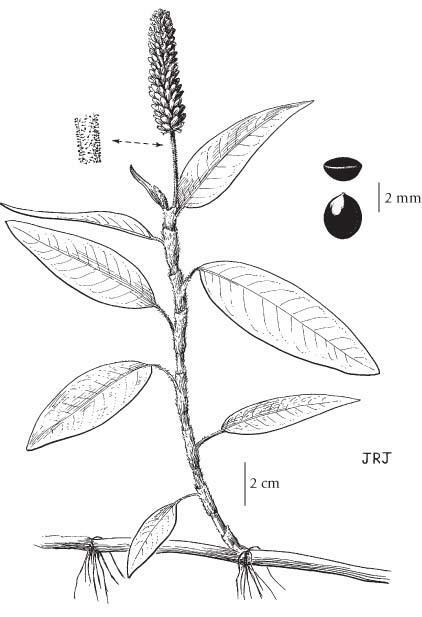 Persicaria amphibia is a highly polymorphic aquatic species with two recognized but intergrading varieties in North America: var. emersa and var. stipulacea (Flora North America 2010). Both are widespread in the US and Canada, with a few exceptions in the northwest and southeast (USDA 2010). Plants which bloom in water, or are sometimes stranded on land during draw down periods, are recognized as var. stipulacea, while plants that bloom on moist soil are recognized as var. emersa (Flora North America 2010). Aside from habitat, characters that separate the two varieties include habit (erect or prostrate) and inflorescence shape. Perennial herb from a rhizome or stolon; stems prostrate and freely rooting to ascending, several, simple, with erect tips and flowering branches up to 30-80 cm tall/long. Basal leaves lacking; stem leaves lanceolate to egg-shaped, usually floating, smooth above, hairy to smooth below, the blades 5-15 cm long, the stalks up to 1/2 as long as the blades; stipules smooth to hairy, cylindric, 1-2 cm long. Inflorescence of 1 or 2 terminal or subterminal, spikelike panicles, 1-8 cm long, 1-2 cm wide; perianths scarlet to rose, 4-5 mm long, 5-lobed. Achenes, lens-shaped, brown to black, smooth, shiny or sometimes dull, 2.5-3 mm long. 1. Stalks usually glandular-hairy; inflorescence usually at least 4 cm long, cylindric................... var. emersa Michx. 1. Stalks usually smooth; inflorescence rarely 4 cm long, egg-shaped.................... var. stipulacea (Coleman) Fern. Wet shorelines, ditches and shallow water in the lowland, steppe and montane zones; var. emersum - infrequent in S BC, rare northward to NE BC, var. 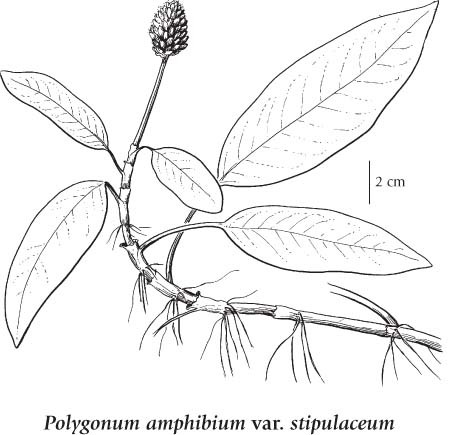 stipulaceum - common throughout BC; N to AK, YT and NT, E to NF and S to FL, TX and CA.